The perfect summer salad full of Mediterranean flavors! Marinated chicken with an extremely delicious salad! Marinade chicken with paprika, Knorr Chicken Powder, garlic crushed and oil. Heat oil in a non-stick pan, once the oil is hot add chicken into the pan cook for 2 minutes each side and finish it in oven for 8 minutes 175°C. Season Mix peppers, Zucchini, Eggplant with oil, garlic, salt and roast in oven for 15 minutes at temperature 175°C. 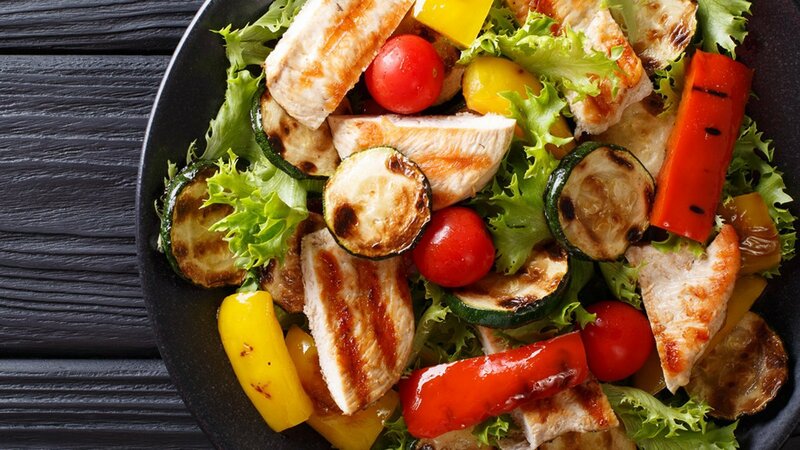 Add the Remaining ingredients into mixing bowl, add the roasted vegetables add half of Best Foods French Dressing and mix well then transfer into serving bowl, Garnish salad with Chicken, herbs and Best Foods French Dressing. For Juicy Chicken Use Knorr Chicken Stock Powder Instead of Salt.